FIGURE 4: Bidirectional promoter reporters. (A) Galactose inducible bidirectional promoter, cells carrying pDK-HGG-GFP-mCherry were induced with galactose or grown on glucose for 6 hours, scale bar 1 µm. (B) Constitutive-inducible promoter, cells carrying pDK-HTC-GFP-mCherry were grown with and without (control) copper2+ for 4 hours, scale bar 1 µm. (C) Constitutive bidirectional promoter, cells carrying pDK-HTG-GFP-mCherry were grown on glucose containing medium to middle log phase, scale bar 1 µm. 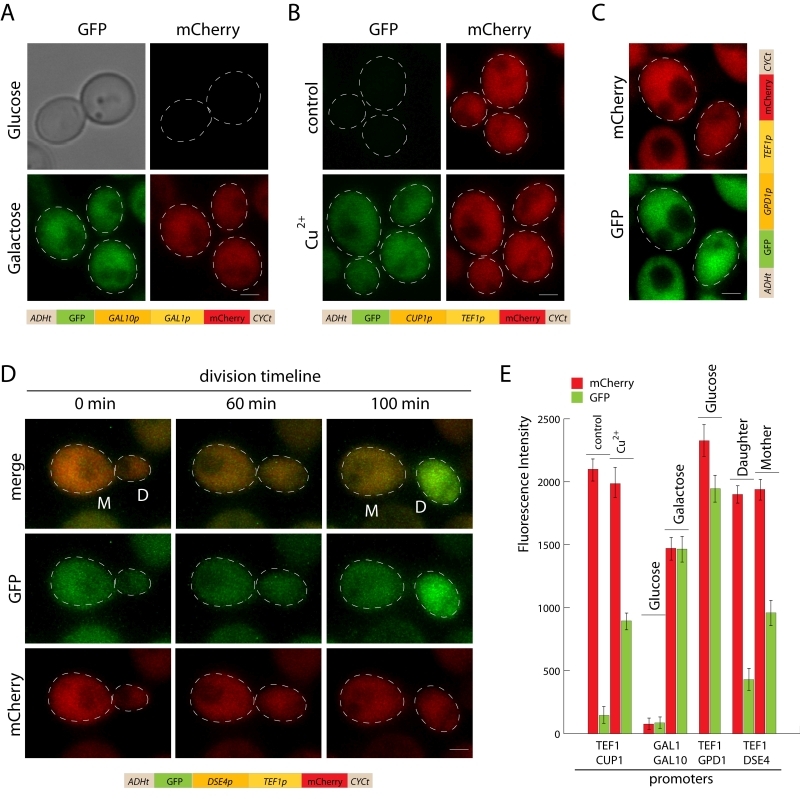 (D) Daughter-specific-constitutive bidirectional promoter, cells carrying pDK-HTD-GFP-mCherry module were grown on glucose containing medium on the microscope, frames are shown (0 min, 60 min, 100 min). (E) Comparison of fluorescence intensity of bidirectional reporters, the graph shows the average of fluorescence intensity of 20 cells and standard error.